A treasure trove of dark-matter detectors rests within the deep reaches of Italy's Apennine Mountains as part of the Gran Sasso National Laboratory. The mountains shield them from cosmic rays, making these detectors highly sensitive to dark-matter particles. Pushing the envelope for still higher sensitivity is the trove's newest jewel, the DarkSide-50 experiment, which is nearing the end of its construction. DS-50 will use 150 kilograms of low-radioactivity liquid argon, which Fermilab is helping to obtain, as target material for highly sought-after dark-matter candidates called weakly interacting massive particles, or WIMPs. The mountains can't protect against all types of background contamination, one being radioactive decay from the materials of the apparatus � a major concern for dark-matter detectors like DS-50. When a WIMP interacts with an argon nucleus, the nucleus will deposit the energy it is given in the argon, producing a flash of light and ionizing some of the argon atoms around it. "Radioactive decays can mimic a WIMP because they deposit energy in the liquid that is close to the energy of interest," said Fermilab scientist Stephen Pordes, who works on the experiment. In addition to using low-radioactive target material, the cryostat that will house the detector is made of low-radioactivity steel. Also, the air in the room where scientists are currently assembling the detector is free of radon, a radioactive element usually present in air that can stick to the materials. DS-50 will be the world's first detector to use low-radioactivity liquid argon. Moreover, scientists are designing it to have some of the lowest rates of background events compared to similar detectors. "The strategy we're following is to reduce the number of background events to less than 0.1 in three years," said Luca Grandi, a research associate at Princeton University. "That way, if we do get a bunch of events in the detector, it's a good bet that it will be WIMPs." Next door to DS-50 is the ICARUS experiment, which includes the world's largest liquid-argon chamber used for detecting neutrino oscillations. The ICARUS detector holds 600 tons of liquid argon but, even if scientists were tempted to borrow some for DS-50, it would be of little use. ICARUS' and similar neutrino experiments' detectors generally use liquid argon extracted from the atmosphere. DS-50 uses liquid argon extracted from an underground mine in Colorado. The difference is that atmospheric argon contains a tiny amount of a radioactive argon isotope formed when cosmic rays strike the argon atoms in the atmosphere. When these argon isotopes decay, they produce small energy deposits inside the ICARUS detector. The deposits' energies are of order 100 times smaller than the neutrino interactions ICARUS studies and are ignored in the ICARUS detector. However, those same low-energy deposits would be bad news for DS-50 since they look too much like potential WIMP interactions, which could trick scientists into crying, "WIMP!" Fortunately, cosmic rays can't reach argon deposits deep beneath Earth's surface. Therefore, DS-50 scientists are going to great lengths for the more rare and precious underground argon. In addition to the low-radioactivity components of the experiment, scientists are going still further to quash background contamination by using layered protection. 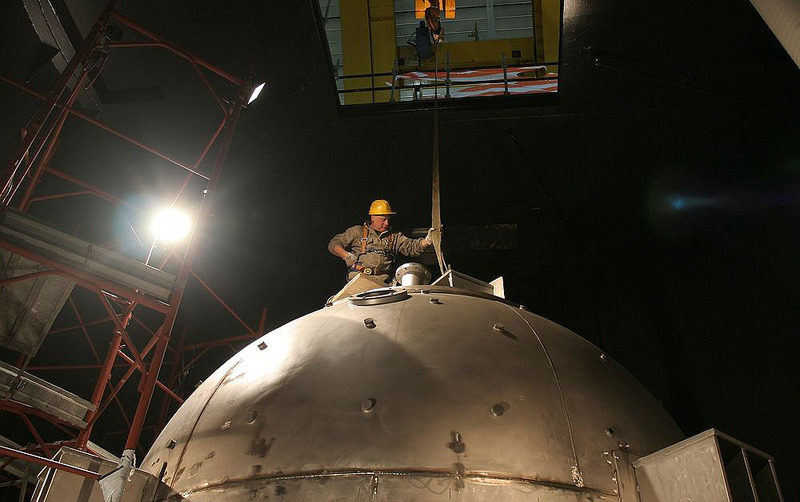 They will immerse the detector inside a vessel with boron-loaded liquid scintillator, which will sit inside a tank of ultra-pure water, similar to the water used in Japan's Super-Kamiokande detector. The water will shield the detector from most radiation coming from the walls of the experiment hall, and the liquid scintillator will detect any particles that do get through. Six countries, China, Italy, Poland, Russia, Ukraine and the U.S., are collaborating on DS-50. Co-spokesperson Cristiano Galbiati of Princeton University said, once finished, DS-50 will pave the way for next-generation dark-matter detectors. "There are many potential experiments considering low-radioactivity argon, but we'll be the first to test it," Galbiati said. Each of the dozen or so dark-matter experiments in the world has advantages and disadvantages, Pordes said. "More important is that if anybody has a signal, somebody else better have a signal and they better have a signal in a different technology," he said. Thus, DS-50 is a link in a chain of detectors that, together, could uncover the invisible material comprising 84 percent of the matter in the universe.